Kuwait is a country with very unpredictable weather conditions. Though we have cinemas, shopping malls and beaches, sometimes the weather will be not in favor to step out of the house; it will be either very hot or humid or dusty or very cold. We will be forced to stay indoors during those days. Weekends are boring when you have bad weathers but some good food and company can make them interesting. We have a bunch of friends here who are like family away from family.We decide on the menu, shop the ingredients, cook up a proper meal and spend the weekend indoors. 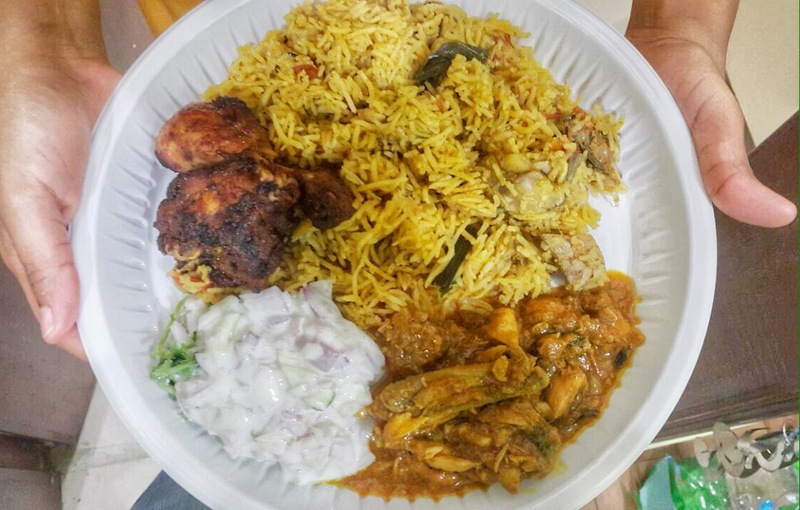 We usually make briyani because it’s a universal favorite, can be cooked in one-pot, so less vessels to clean.One curry and raita to go with the briyani and dessert will be a simple payasam or kesari or ice-creams. Maybe, I will do separate posts in honor of the amatuer cooks in the group and their signature dishes in future. IF at all , there is food remaining, we all pack it for work the next day. Who would go back home and cook after a feast like that?! So, what are your weekend plans? It looks so yummy. I am a biryani lover!! Nice to know that you have team of friends with same taste! I remember our “Pot luck” sessions after seeing the post, this kinda become our week to week activity nowadays and with expanded circle now we have 7-9 families participating in a house (we had to literally search for a place to settle in on a 1000 sq ft house with more than 20 people). But one thing for sure is the grand feast and the second thing for sure is we won t be able to walk for next couple of hours. Card games and all the talking , it s so much Fun !!! Previous Previous post: Bun and blogiversary!